I believe that Masham Gallery should be a positive presence in the world. We work with artists and craftspeople, source all our products and packaging with this in mind and leave as small a footprint as we can. The majority of artists and craftspeople we work with are the very best from the region, some from across the UK and a very few suppliers from abroad (these are sourced with much consideration of environmental and ethical issues). Many of the artists and craftspeople sell here on a sale or return basis giving them more of the profits from sales. We are pleased to be able to offer a particularly low commission rate for sales to artists. Over the years (since 1994) we have worked with many charities and community groups on specific projects and exhibitions including recently Herriot Hospice Homecare, The Woodland Trust and Masham Arts Festival. We are proud to be an active participant in the creative community in Masham and North Yorkshire. Currently we are an angel to the amazing North Country Theatre, we sponsor Crafted By Hand and contribute to many other smaller events in the region and beyond. I work as part of a team with some excellent part time staff of all ages. Everyone who works here has a knowledge and interest in art and craft (we can help you with the differences between collagraphs and etchings or stoneware and porcelain for example!). All of us continually learn about art and craft from the artists and makers that sell here and other organisations. If you want to learn art and craft skills yourselves we reccommend the excellent Artison in Masham. Masham is a beautiful small ancient market town. Nestled in the lower reaches of Wensleydale by the river Ure Masham is idylically located. The town has a very creative history, Turner visited here and nearby Hackfall, Royal Academicians George Cuitt and Julius Caesar Ibbetson lived here as well as other writers, poets and musicians. 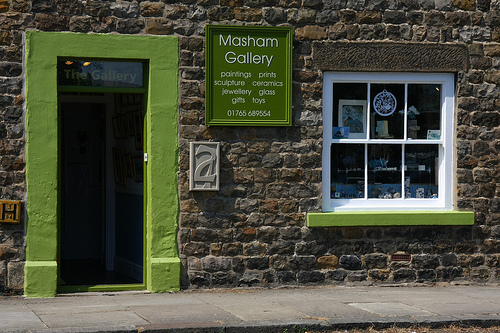 Today Masham still has a very friendly welcoming creative community with four galleries, a glassblowers, an active arts programme at the town hall and many musicians, artists and craftspeople as part of the community. Maybe it's the beer - although the town has just 1000 souls two breweries (Theakstons and Black Sheep) thrive here, as do four pubs. There are two beautiful sculpture trails around the town, one of swifts around the centre of Masham and the oak leaf trail that is about a 3 mile walk around the area. Masham does events well - key highlights of the year are the Sheep Fair and the Steam Rally, if you love art and craft don't miss Crafted By Hand either. With some great walks, interesting places to shop, eat and relax we think there's a fair bet you'll love it here. Check out visit Masham for more details and the fabulous dales discoveries for independent insiders info about the rest of the dales.